I'm not a Project Lifer, but my friend is (of sorts), she tends to have the PL pages, and then a couple of layouts on key events and then creates a mini album / book to cover a specific topic, if she has lots to scrap about. She does have a lot of time on her hands! Love your blog, so very pretty!!! I record the everyday in my PL album and if I think a particular bit merits a scrapbook page in its own right, it gets one. The page then usually goes in to our 2013 album. Although sometimes it might be for The Boy Child's album and our holiday to Florida this summer has an album of its own, too! I agree that PL does eat in to general scrapping time ~ I haven't found a suitable solution yet! It his is my first year of doing PL so I'm certainly no expert, but I have recorded certain things in my PL album on a quick, get it in, sort of way and then scrapped a 12x12 or even a mini book on a more important event. I did PL in 2012 traditionally: all pockets and detailing the little things and referencing the big things. The big things went onto 12x12's in another album. I wasn't sure about this although I loved the PL better. In 2013 I put it all together, some of it goes in pockets and some is 12x12, they link together and although it can be harder to make it 'fit', the pocket pages need to be filled before moving into a 12x12 that goes but I am pleased with how it has turned out and also that I have it all in one place, can do the pocket thing and make 12x12's too. I have done two separate years of photo-a-day projects using Project Life products. For the larger events, I have done two things to include them within my album(s): 1) create "regular" 12x12 layouts and insert them in the album within the corresponding week. 2) create inserts using pocket pages (I preferred my inserts to always be shorter in width than the main pocket pages for the week). I have also made mini-albums--on top of the documentation in the photo-a-day project. That is, I included one photo for each day in the main album, then made a completely separate mini-album for the event. There usually aren't inserts for those big weeks (though I should probably add a note somewhere within the week of day-by-day photos that there is a whole separate project covering the event. Great to see and hear your take on PL! I'm a sort-of monthly PL-er, but I'm pretty relaxed about timescales. I also love the 3x4 cards, but there's no way I could keep up with this weekly. So I pick the monthly highlights, and usually do a double-page spread, and sometimes add inserts (or more pages) if it's busier. For big events, I either include them in inserts, or I'll do a quick overview then put the rest in a separate mini album or photo book. Looking forward to seeing the rest of your layouts! It's looking very light and bright. Love the split photo idea on the Life is Beautiful card. I know I would have the same time issue which is why I've never attempted it. It would be a good way of doing LSNED or JYC though. I think I read some PL and 12X12 scrapper say that they have a reference in the PL to the bigger page. Why ask Melissa Stinson (aka Scrappyjedi) she does both awesomely. I do not do Project Life but I have been tempted many, many times... right now I do My Month in Numbers in pocket style but that's one spread a month. 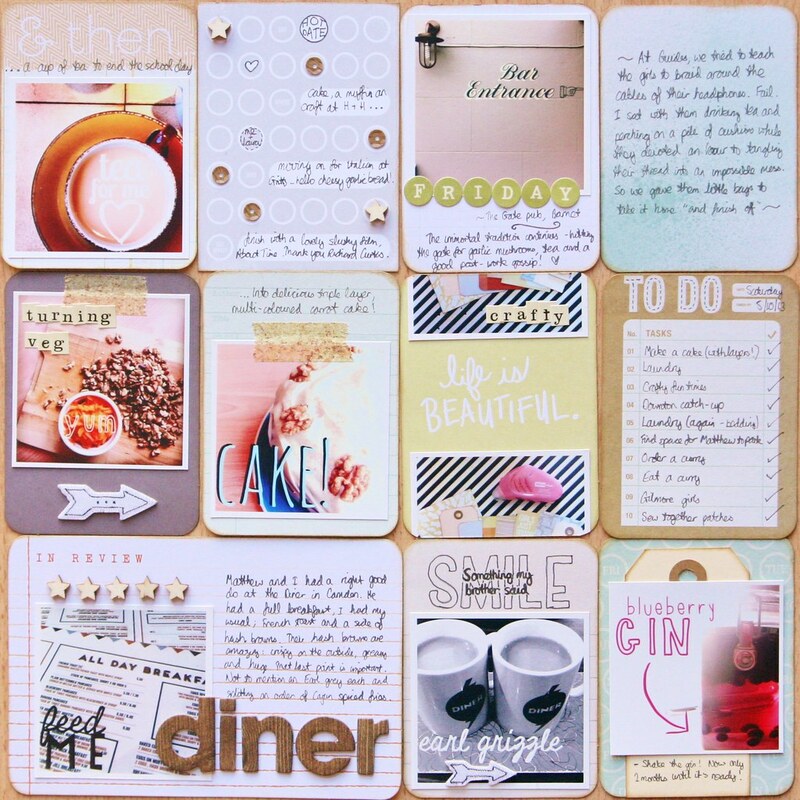 I really liked reading about your thoughts on this type of scrapbooking... I feel like I am missing recording the "little things" by not doing PL but will remember your idea of using that feeling towards nice big pages about little things :) Merci!